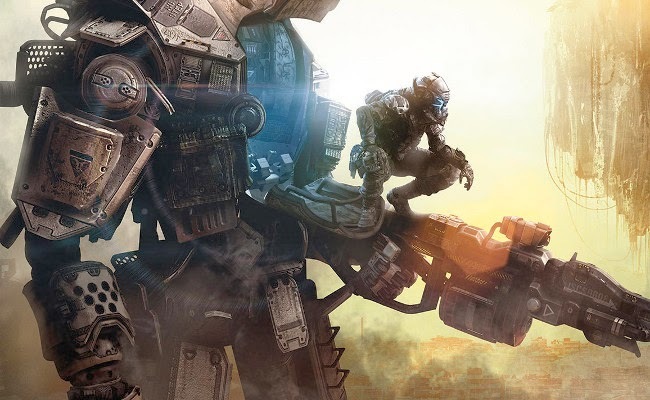 This week on PopMatters I voluntarily question my achievements in Titanfall. Titanfall is completely focused on competitive fps shooting, a genre I usually pass on. However Jorge and I made a pact to give the game the old college try, fully aware that we would likely be overrun by a mass of ridiculously skilled players in a week. It seemed important to get a sense of the game that (for better or worse) is being looked at as the standard-bearer for the current console generation. Of course, we're both playing the PC version, but the implications of that are a topic for another week. I actually enjoy the feel of Modern Warfare, so the idea of the those developers adding mech combat and parkour to the mix is quite alluring. Overall I've enjoyed the dozen or so hours I've somehow found time to sink into Titanfall, but I go back and forth on exactly why I'm enjoying it. I have the sense that some of it might be psychological tricks that are distracting me with achievements. I've gotten splashy, endorphin-inducing unlocks simply for walking around or playing dozens of games. In exchange for the most cursory amount of effort I get to see my progress bar fill and my level rise. Of course, sometimes genuine feats of skill such as besting opponents or contributing to match objectives help me, but I feel like I am getting plenty of rewards for simply being there. But maybe that's not so bad? After all, some of the challenges inspire me to mess around with different guns or tactics. If the challenges themselves are interesting, does it really matter that I get some feeling of achievement for cool wall-running even if I don't win the match? These days, my game time is so limited that a couple quick victories might be worth not having the slog towards the nirvana of true mastery. Still, the thought that many of those trophies are handed out just for showing up makes me hesitant to place them on the mantel.